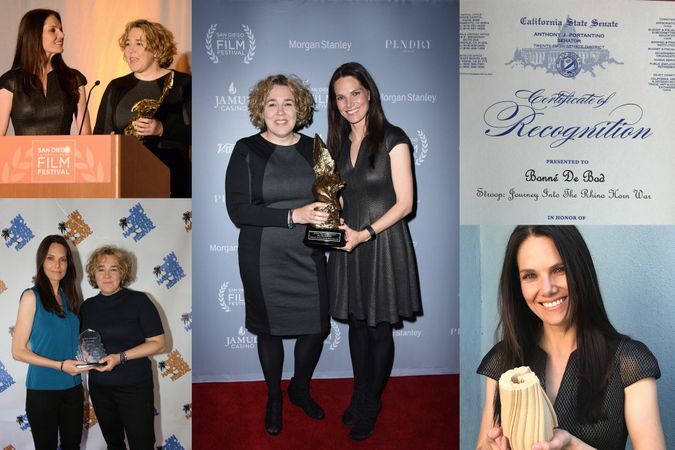 The South African feature documentary STROOP – Journey into the Rhino Horn War has won the coveted Best Documentary award at the prestigious San Diego International Film Festival held this past weekend. Hollywood’s Mudbound producer Kyle Tekiela presented the award to filmmakers Bonné de Bod and Susan Scott saying, “documentaries tell stories that bring big issues to light and the jury felt this was one of the biggest of them all, that poignantly conveys the struggle the world’s rhinos are having to remain alive for the next decade”. The weekend was a winning one for the filmmakers as they also scooped an additional two awards – from the LA-based Glendale International Film Festival where they picked the Best Female Filmmakers award (a huge accomplishment given that over 130-films across fiction and documentary were in competition, which meant that STROOP was given the nod across all genres). And – also in LA – from the city’s premiere film festival, LA Femme, which supports women producers from around the world, De Bod and Scott were awarded the Special Documentary of Focus Award. The previous weekend, the film received another nod in the form of Best Documentary award at the San Pedro International Film Festival, also held in Los Angeles, and last month, STROOP was handed the 2018 Green Tenacity Award by the judges of the San Francisco Green Film Festival. In recognition of the impact the South African film is having in California, the California Legislature as well as the State Senator have sent the filmmakers certificates of recognition from the State of California for outstanding achievements in the cinematic arts, thanking the South Africans for their work in revealing the rhino crisis to the world and contributing to the arts and the Californian community. Says STROOP producer and presenter de Bod: “Winning these awards has opened up new opportunities to get the film seen around the globe. Adds director Scott: “I do find it incredible and ironic that the state of California is recognising the film in such a huge way, because many times during filming, we were told to put Americans in the film to give relevance for the international audience. But this has connected with Americans precisely because it’s about ordinary South Africans doing extraordinary things for our planet. 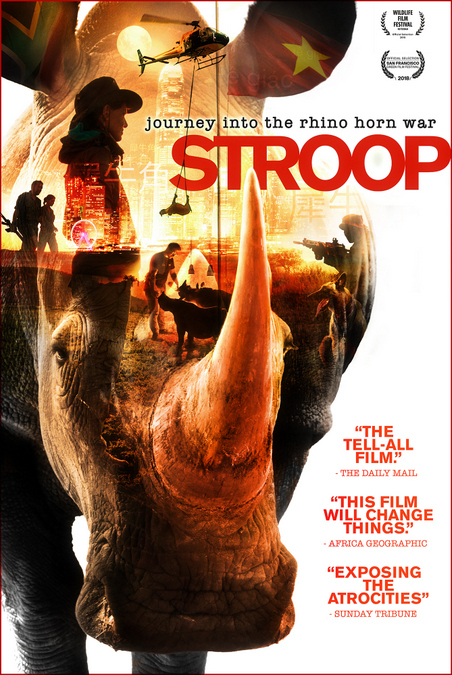 STROOP – Journey into the Rhino Horn War tells the shocking and touching story of the ongoing poaching of rhino and the trade in its coveted horn. In addition to the slew of awards the film has won, STROOP has been invited to screen at no less than 15 official film festivals, and this number is growing daily as it receives worldwide attention and acclamation. 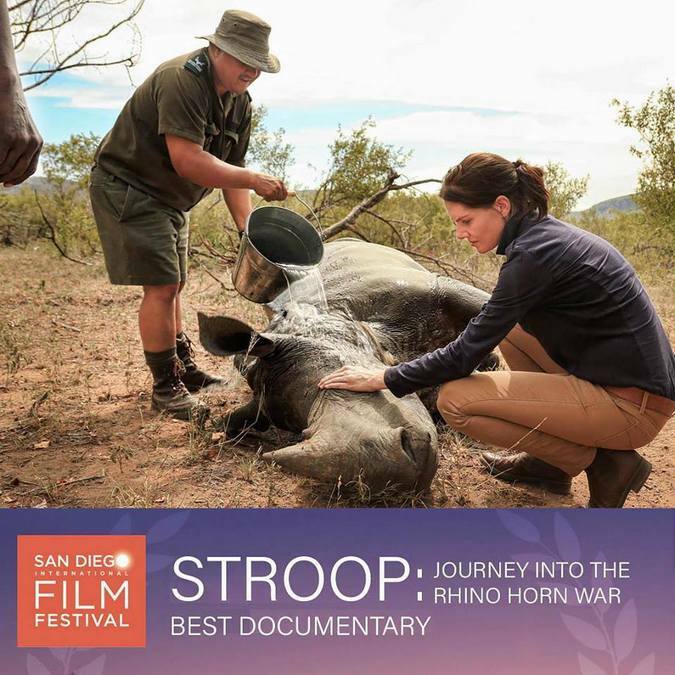 STROOP – Journey into the Rhino Horn War tells the shocking and touching story of the ongoing poaching of rhino and the trade in its coveted horn. In an exclusive first, de Bod and Scott filmed special ranger units inside the Kruger National Park and at the home of the white rhino, the Hluhluwe iMfolozi Park. 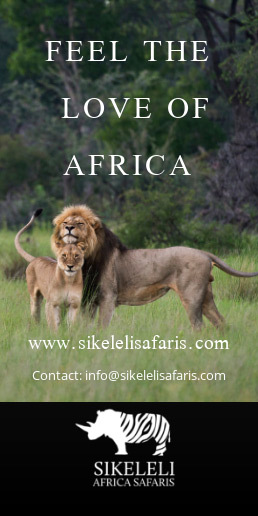 The pair also travelled undercover to the dangerous back rooms of wildlife traffickers and dealers in China and Vietnam and the result is a powerful, hard-hitting and incredibly moving documentary that will challenge and shock viewers. STROOP – Journey into the Rhino Horn War will premiere in South Africa later this year.